During the first two years of WWII there was little interest taken By the Air Ministry in the development of transport aircraft for the RAF, the Air Staff’s efforts being almost confined entirely rightly to improvement of fighters and bombers. Transport operations were undertaken by a mixture of converted obsolescent bombers, flying boats and impressed civil aircraft and American aircraft had been ordered to supplant them. 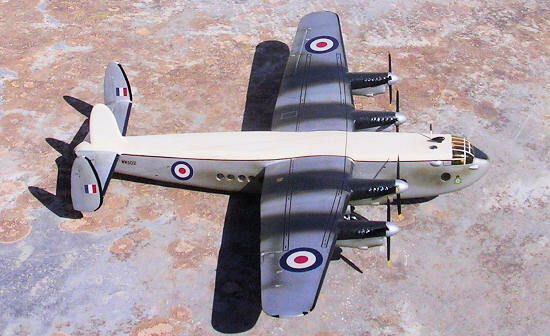 It is tribute to Avro’s chief designer, Roy Chadwick that in 1941 he foresaw the need for a long range, four engined transport aircraft and proceed to redesign the Lancaster bomber. In a remarkable short time of 5 months, the prototype York LV626 flew for the first time on 5th July 1942 from Ringway. This made use of a Lancaster wings, Rolls Royce Merlin power plants, undercarriage and tail assembly. Merged to a completely new fuselage of tapering square section, that doubles the Lancaster’s capacity had been designed, considerably altering the aircraft’s characteristic appearance. Trials at Boscombe Downs followed, successfully followed by 3 more prototypes. Still production was slow in getting under way because of shortages of materials and need for priority to the Lancaster. One immediate need that the York fulfilled was as a VIP Transport. The third prototype LV633, named ‘Ascalon’ was allocated as Mr Winston Churchill’s personal flying conference room and was luxuriously fitted out having fewer square windows instead of the characteristic row of circular ones. It also featured a third central fin, which was adopted as standard on all subsequent Yorks. Later VIP versions of the York were supplied for personal use of Field Marshal Jan Smuts, General De Gaulle and the Duke of Gloucester and lord Lewis Mountbatten. The York Ascalon was delivered to No 24 Squadron at Northolt in March 1943. It carried Churchill to Algiers in May and just a few days later it carried George VI for his first visit to troops in North Africa. Production of the York C Mk1 built up slowly and other VIP version were delivered. Five early aircraft delivered to BOAC for service from April 1944 and a further 25 were delivered from August 1945 for Joint operations with transport command. During 1945 No 511Sqn at Lyneham became the first unit to receive a full complement of Yorks and eventually 108 Sqn flew the aircraft in RAF service. 7 of these squadrons were equipped in time to perform 29,000 sorties in Berlin Airlift from 1st July 1948. Production ceased with delivery of 257th York on 29th April 1948. Total production comprised 4 prototypes, 208 aircraft for the RAF and 45 civil aircraft. The latter with 1620 HP Merlin 502 engines. There were 25 aircraft for BOAC, 12 for British South American Airways Corporation, 5 for FAMR of Argentina and 2 for UK based Skyways. 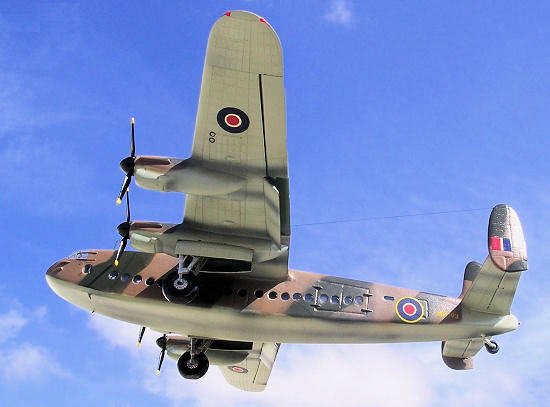 One York was built in Canada, 4 were bought from the RAF in April 1947 for use with the French Aeronaval with Transport Flight 31S and were not retired until 1963. In due course Yorks were operated by several airlines including Scottish Aviation Limited, Hunting Air Transport Limited, Dan Air Ltd, Eagle Aviation Ltd. Skyways Air Freight remained the largest York operator, even augmenting the fleet with a few ex-RAF Yorks. These were used on Colonial Coach service between London, Malta and Cyprus until 1957. Both military and civil Yorks made frequent use of the airfield at Hal-Luqa, Malta. Whereas none of the military Yorks in RAF service were listed as being involved in accidents, not the same can be said about the civil types visiting Hal-Luqa. In fact there were three York accidents. On 13.4.54 a Scottish Aviation York G-AMUM came to grief beyond repair; on 18.2.56 Scottish Aviation York G-ANSY exploded on impact soon after an aborted take off making a shallow dive over the village of Zurrieq with no survivors of the 50 on board the aircraft and on 25.5.58 a Dan Air York G-AMUT overrun runway 06, no fatalities. A typical history of a military York in RAF service is that of MW183, which is being represented in kit build. This York was a Ringway built 2.6.45 and delivered to 511 Sqn 13,6,45 transferring to 246 Sqn21.3.46 and coded VU-R. A category AC flying accident 12.10.46 was re-assessed to cat A and aircraft repaired by unit prior transfer to No 511 Sqn 31.10.46.. Then went to Avro Langar for major inspection 9.1.47-8.4.48. To No22 MU 9.4.48 for storage during which to AST Hamble for modifications 20.12.48-28.2.49. To Abingdon 2.3.49 for ‘PLAINFARE’ on completion of which sent to No 23 MU27.9.49 for storage. Refurbished by Fairey Ringway 30.4.51-17.1.52, for storage being declared NES and sold to Surrey Flying Services 22.9.52. Registered G-AMUU. The Contrail kit is a vac-form type made of soft white styrene having side windows crudely printed to indicate their position on the fuselage. In addition I used a Revell Avro Lancaster kit so that wings, engines, tail planes and undercarriage legs could be utilized. Since the old Revell kit had undersize undercarriage I have replaced it with a set of main wheels issued by Pavla Models set U72-69 1/72 scale. There are three known ways that one has on offer to build a York to a scale of 1/72. Leaving the resin conversion kit apart, which only appeared in recent years, we are left with two options. A York can be built by scratch building a fuselage from wood and merging it with one of the Lancaster kits found on the market. 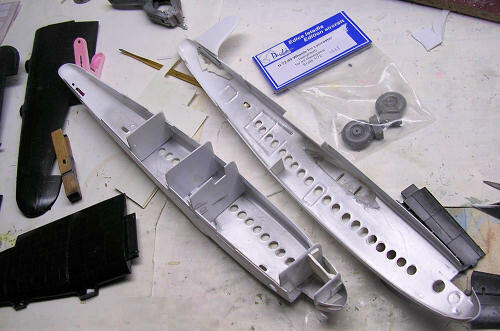 An alternative method is to make use of the Contrail conversion fuselage and again merge the kit with the rest of parts from a Lancaster kit. 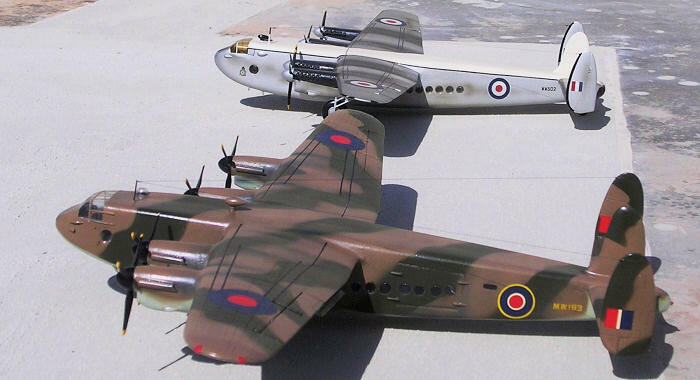 I made two York models; both in RAF service and carried different markings as reflected by the time these were in service operation. The York in post war colours of silver overall with white top was made by first building a fuselage from yellow pine, moulding cockpit canopy, building side circular windows on a strip of plastic card which is then joined to the side of the wooden hollowed fuselage. The alternative method, which is being described in some detail, was made using the Contrail conversion kit. The two-part fuselage was cut and sanded as if I am building a vac form kit, checked for correctness in overall length that was 13.08 inches. The length of the kit was found to be correct but on checking the fuselage width alas it was found to be too narrow and needed a spacer cut from the backing surplus plastic card to fill a gap which was ¼ “ at forward cabin area and tapers to 1/8 “ at the rear of the fuselage. Two strips of styrene were cut and with one being wider throughout the length these were fixed in a laminated form so that the wider one will overlap on the inside of fuselage and the narrower one produce the required width of the model which is flush with the roof. Widening the fuselage for correctness also meant that the clear canopy that comes with the kit is well undersize and needed replacement with a newly moulded one. So I used the same wooden male prepared for the previous York I built and produced two in clear acetate, one being spare in the event it comes handy. The vac form fuselage windows were drilled and shaped circular using a round file close to the diameter required. The fuselage contained a number of bulkheads which when fitted in their respective station they will greatly strengthen the fuselage. Obviously with the kit fuselage being widened, the ones that came with the kit were replaced with new wider ones that were cut from backing styrene. Turning to the Revell kit of the Lancaster bomber this had 3/8” of the wings removed at the wing root. I carefully marked a parallel line to the end and used an Exacto blade to cut the surplus part to bring the overall wingspan exactly 17”. Two long wing spars in the shape of rectangular channels were cut and fitted through the fuselage wing roots through slots carefully cut in places to receive them. I used Contrail struts for these spars. Further work included detailing the cockpit crew office to house a pilot and co pilot. These were at a staggered seating level. Crew seats, scratch built from styrene, instrument panel, coaming and central console and control wheels were all added in place and painted in black, white and grey. Freight area was painted black and so were the four bulkheads glued inside across the fuselage interior. Fuselage was now closed. The cut canopy was then fitted and glued in place, using a small amount of Kristal Kleer with the effect that the kit now started to take shape. With the fuselage now closed and set, filler was applied wherever it was needed and panel lines re-scratched, the rest of the kit follows the Lancaster instruction with the difference that we have a new fuselage to replace the bomber one. 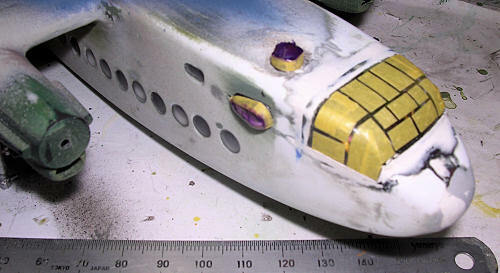 The fuselage had the wings slotted to it, which were secured with super glue and faired with Plasto putty. The filler was added on a little at a time until a gradual smooth fillet was created and helped the wings to remain firm in place. Other detail added included aerials, detail to undercarriage legs, open the side air intakes mounted on each Merlin engine, three control streaks to ailerons on both wings added. These were made from stretch sprues. Tail trim tabs were modified and an astrodome was glued to rooftop aft of cockpit. Wider diameter main bogies from the ‘Pavla resin set’ replaced the undersize undercarriage supplied with the Revell kit. These were detailed and had flattened part that rests on the ground. I consider this kit conversion rather a straightforward kit build if compared to one where the kit had to be a completely vac form type, or as was the case of my earlier York kit where the fuselage was made of wood. In this case widening the fuselage was the only setback. Careful measurement of the fuselage width sorted this problem. The prototypes and production aircraft produced during the war and for an initial peacetime period all had the upper surface finished in the standard dark green and dark earth camouflage. The camouflage pattern issued with the Contrail kit instructions appeared to conform to that I have seen in photos of the same aircraft I built. York MW183 was a production type, which had sky blue underside and carried C1 roundels. Later peacetime production were painted overall using lightweight aluminium silver coloured dope with D type roundels and fin flashes. Serials were black or yellow. VIP aircraft were stripped of paint and the metal surfaces highly polished. Later examples of York also had a fuselage blue trim with the upper fuselage painted white. This was an asset for Yorks operating in the Near and Far East region to cut down heat absorption. Roundel decals and fin flashes came from the Revell kit while small serials were picked from decal spares box. I must admit I enjoyed making this model in particular and am very pleased with the result. It has a special place as the York brings many happy memories of my early childhood. Even though I lived some 2 miles from Hal-Luqa airfield, the York low rate of climb made them fly very low barely 1,500 feet with the tremendous noise of four Merlin engines going at full blast as they flew by over the town of Marsa. 1. Avro York mini-monograph by Chris Ashworth. 2. Local (Malta) aviation history data via Aviation Museum at Ta’Qali. Thanks to me and my fondness for anything different from the norm for this one.